The GLPOA Annual Smelt Fry is a great way to meet your friends and neighbours for a tasty meal, while supporting the GLPOA in our efforts to reduce the invasive smelt population in the lake. 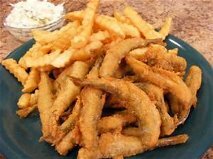 The smelt served at this event are caught in the spring (usually around April), then immediately cleaned and frozen for consumption at the Fry. Co-hosted by GLPOA, Cottage Cup and The Sands, this fabulous event takes place at The Sands on Golden Lake.